Japan, Don't Worry About Noodle Harassment! Or in Japanese, “nuuhara” (ヌーハラ、which is short for “nuudoru harasumento”). The word came to a wide audience last fall when Japanese morning show Tokudane! (via Matome Naver) did a noodle harassment segment. Co-host Rei Kikukawa had to explain what the heck “nuuhara” meant to the Japanese viewing public. And what did visitors think of Japanese noodle eating habits? Those Swedish folks visiting Japan for the first time thought the noodle slurping sounded like a pig. These visitors from the U.S. thought the same. This New Zealander visiting Japan for the first time said it made her feel like not sitting in the seat next to a slurper. Here, on another show, reasons why (some?!) foreigners don’t like slurping include the previously mentioned pig noises as well as other complaints, including noodle slurping sounds like a toilet flushing. Okay. Sometimes television, especially morning television, in Japan can be a bit overblown. Yet, long after the segment aired, people continued to talk about nuuhara. Much of the reaction in Japan was people feeling like they should eat noodles however they liked in their own country. I agree! But as Excite News pointed out, there’s concern about how this will look during the Tokyo Olympics if visitors are getting annoyed at restaurants across the city. Slurping noodles is not unique to Japan (here, Anthony Bourdain is teaching President Obama how to slurp noodles in Hanoi.) Plus, not every Japanese person slurps. Some cannot, while there are those who do think it’s bad manners. Of course, not all foreigners are against noodle slurping! Hiroshima Toyo Carp first baseman Brad Eldred says that he slurps on purpose because he knows it pisses off other foreign players. 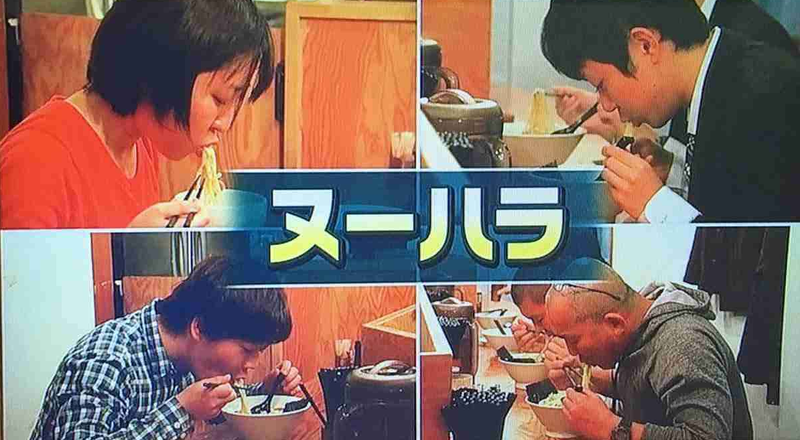 Most Japanese noodle aficionados, however, do slurp to varying degrees of slurpiness. Why? There are several reasons, with one being that noodles are hot, so slurping them helps cool them. Another reason includes that noodles are a working person’s food, so manners can be checked at the door. But the best reason I’ve heard is that by slurping, the noodles and their broth taste better, because you as slurp, you are opening up your nasal passages and inhaling all the soup’s delicious scents. If you were to just bite off noodle pieces, you’d miss all those aromas and flavors. So, for goodness’ sake, if you are eating noodles, whether that’s ramen, udon, or soba, please slurp. If anyone gets annoyed while you are doing that, pay them no mind because they’re missing the point entirely.